It’s spring break. And I’m not having much fun at all. To start with, on Sunday I fell off my bike. Hard. My grandmother says I walk like she does — one of my legs is bruised from my hip nearly to my knee, and it hurts. Grandma has been putting something called Biofreeze on it. It’s blue, and it goes on really, really cold — like ice. Then it gets warm. It makes the bruise feel better. But not enough better to really do much. So here I am. On spring break. There’s a trampoline in the yard. My friends are riding bikes. And I am too sore to do either one. To make things worse, I was really looking forward to juggling this week with the Circus Freaks. They juggle and work on all kinds of circus acts from 8-10 p.m. every Tuesday and Thursday nights at the Gallery at Midtown, inside Valley View Mall. Usually, when there is school, I can only go for a little while. But when school is out, I go for the full two hours. But when I fell, I tore a hole in the heel of my right hand, about as big as a dime. It still hasn’t scabbed over, and it hurts every time I try to catch a knife, club, or ring. 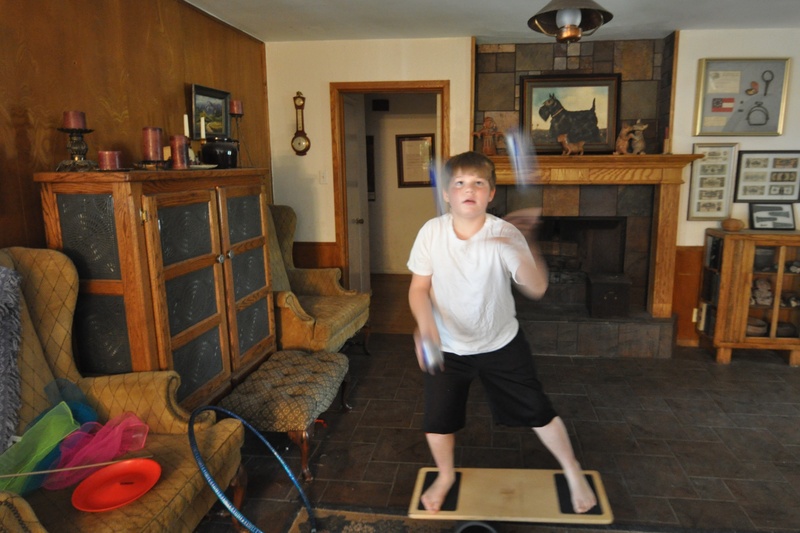 I can juggle with my diabolo, and soft practice balls, but nothing else. Why do I keep getting hurt on holidays? I sprained my ankle at Christmas time. I did NOT need to get all bruised up on the first day of spring break. I am not very happy about it. It’s spring break, and I can’t juggle, balance on my rola bola, work on the trapeze or pull-up bars, or jump on the trampoline. All because of a fall on my bike on the first day of spring break. Boo! ← Dallas Child: Calm Down! I promise when I get to come to New Zealand I won’t hurt myself! I want to come and visit really badly. I don’t really do it on purpose. Really I don’t!